Long time CDL A holder that just began the life of OTR in September of 15 (CDL 99) as a team driver for a Hot Shot company out of Knoxville TN. Will turn 50 in 2016 and have to say this has been the best career move I've ever made and this year my Fiancee will be joining me as my Co-driver.......Life couldn't be better. My Fiancee joined me in May of 16 and we are having an awesome time out here with our new company V3 Transportation running a team Expedite Straight truck. So yeah I guess life can and did get better. Just a little FYI,when TA/Petro upped the fuel purchase to 60 gallons for a shower credit they also extended the expiration to 14 days from 10. With my old company we had the JJ Keller that was tied into the trucks system and ran off of a Tablet, it worked well. Is the Wolcott, Indiana truck stop bigger than the one in Walcott, Iowa? The Petro on I-65 exit 299 dodge city, AL has a dogomat. Forgot to mention that the Iowa 80 in Walcott is totally awesome and no one mentioned it also had a Dogomat where you can wash your dog if you have one, we've used it a couple of times which is awesome cause there's not really any good places out here for that. There are a Petro and TA right across the street from each other in Ontario California that have 590 and 549 spots. 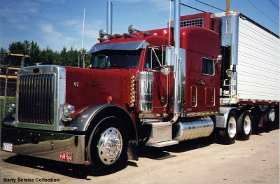 I have had my pre pass give me a red light but the lighted sign board lights up truck ok to by pass scales, I pull in anyways, what would y'all do? Just to let you know that you don't have a clue about the real world and cost, I recently took 2 pallets to the airport in IA going to PA and loaded them on a small twin prop plane, which is way more economical than your jet powered cargo plane. Cost to ship this time sensitive freight $36000 that's straight from the mouth of the salesman in charge of the customer that the freight was being air freighted to. We have a Chocolate Lab and a Boxer with us on our truck, the lab is almost 3 and the boxer is only 8 months and they both jump up catching the steps as they go up with no problems. The lab has been doing this for over a year now and taught the boxer how to do it. We just make sure the seats are all the way back and the steering wheel lifted all the way up if getting them in on the driver side. Hope this helps. The root of his problem was that he had been drinking so much that he was trunk. He couldn't have been trunk cause he was drinking barks root beer! My companies QualComm setup will automatically switch you to On Duty, Not Driving if you sit still for more than around 3 mins. (I would have to time it to give you an exact number) So in traffic jams it will automatically switch you. Ditto ours does the same! There is a 22 gig cap then you'll be prioritized when systems are busy is what I saw when I switched this a.m. I'm already a Verizon customer and was paying $104 and change for 4 gigs plus phone payment now my bill is $113 and change for the unlimited. I've been out here for over a year now and in my opinion no one can match Verizon's coverage, I had TMobile when I got out here and got Verizon a couple of months after getting out here,my co driver had Sprint and of the 3 Verizon could make calls where the other 2 couldn't. Don't get me wrong you'll find dead spots on Verizon but it's gonna be a heck of allot less places than the other 2. When I say re route I'm talking completely changed when I would jump back on the interstate so not doing it when off the interstate to try to get me back to it through another route. Rainy have you ever hooked it up to your laptop and used the Rand McNally dock to update it? There is a diagnostic and repair in that program. I did an update on mine and it started doing stupid stuff like completely re routing me and adding extra miles to my trip when I would jump off the interstate for fuel or a break, ran the diagnostic on mine and it found several corrupt files then repaired them. Correct me if I'm wrong but as far as I know on my Freightliner the only way you can manually Re gen is if the Re gen light is on. I had a Re gen issue with mine and the only way the tech could initiate a manual Re gen was by hooking up his laptop to the truck. This is awesome, I was an avid bowler but now that I'm out on the road I can't commit to a league like I used to do. I can only hope when I'm on home time that someone needs a substitute and i can go do it. Assuming this is true, this driver is done! It's true just saw this on Good Morning America! Guy blew a .28 - operating a TT? He should be buried up to his neck, and have rocks thrown at his head. Oh, wait - this isn't the Middle East. Dragging a WALMART BOX at that? Hope he was a WalMart corp driver - I can see the company he drives for (other than Wally Corp) losing their contract over this one. After the Tracey Morgan thing, not great press for WalMart. Red Tractor - who is this? US Express? Nope it was Crete Carrier. Put 100,000 miles on my truck! Me and my Fiancee have put 80k since taking ours over and still have a little over 5 months to go to be a year. Only TN and as far as I know it's only in Tennessee lol.